Still really busy. Probably won’t be able to get any good pictures posted to go with our next availability this week. I will do my best but in the mean time here are some pictures of our fall baskets. They are a little dark but it was really early in the morning when I took the pics. Things have been absolutely crazy for me here. With the trade show, new store openings, vacation, sales meetings, production meetings and still being on these blasted crutches, I have neglected updating the blog, but I am not missing in action. As our fall crops get closer to being ready I will be back to posting regularly. The mums are looking great, but they are going to be a week or two late because of the heat. The poinsettias have struggled in the heat too, but the cooler temperatures we have now will help both the mums and the poinsettias. We have some baskets and a few other items that are ready now. 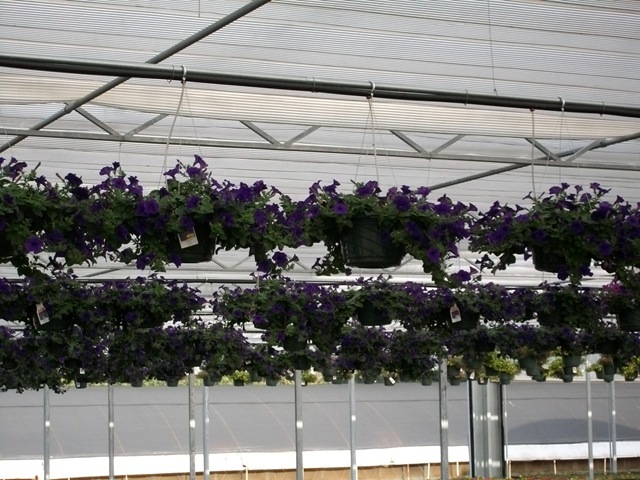 The pansies and other fall annuals will be ready in about 7-10 more days. Pictures on all of these items are coming soon, but next week is going to be as crazy as the last few weeks have been so I have no idea when it will happen but I will get some pictures posted. Call us if you have any questions on what we have ready. I have to go now. It’s 4:38 pm and my wife is hungry. 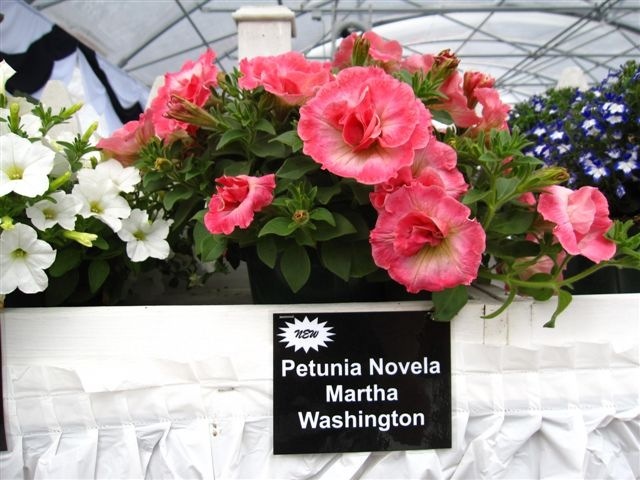 In the meantime, let me know what you think of this new petunia. After a couple of years of mild summers, this one is about to cook us. If you live in the south then you know what I’m talking about. It’s been in the mid-90’s or hotter every day for the last month. There was one cloudy day that may be been like 90 but it was really humid so that doesn’t count. The heat index has been over 100 degrees for most of that time as well. I’ve got to brag on my crew. They have plowed on through the heat without complaining (to me anyway). I’m sure they’ve had some choice words about the heat and their jobs, but everyone can get cranky when it’s 102 degrees. 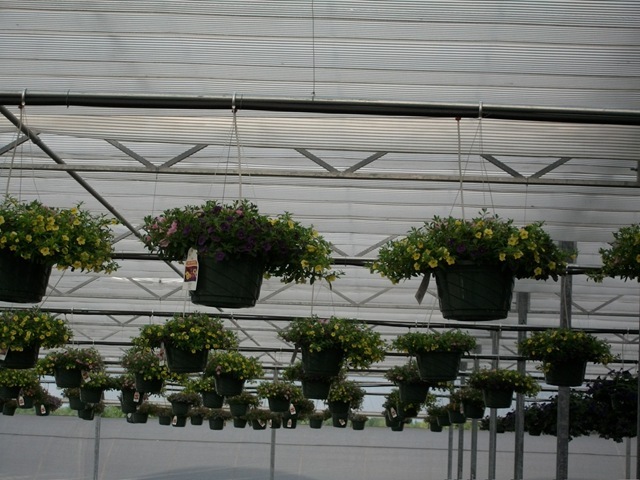 The mums are looking good and the early varieties should have started their bud initiation by now. With this heat, we will almost definitely see some heat delay in the bloom development of the mums. The early varieties will be affected the most and if it doesn’t cool off, we will see it in the mid and late varieties as well. 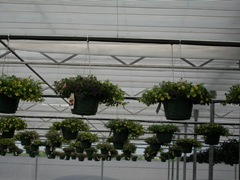 This means that there will probably be at least a 1-2 week delay in when the buds on the mums start cracking open. My best estimate is that the earliest we will have some cracking color will be closer to September 20. I hope I’m wrong. We started planting our poinsettias and the first of our fall annuals last week which included calibrachoa and wave baskets and some annuals for our fall combo pots. 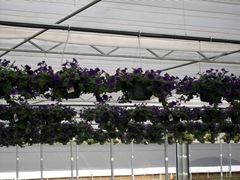 The first batch of pansies arrived Friday and will be planted this week. This is how we use social media around here. If you have accounts with any of these sites, we would love for you to “Friend”, “Follow” or “Like” us. Hey everybody! I’m back from vacation. 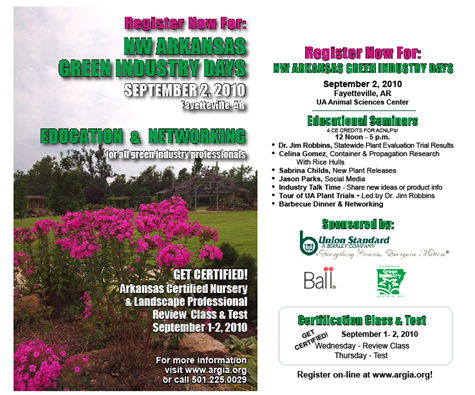 You probably didn’t even notice I was gone, but that’s OK.
For my first post back, for those of you in Arkansas here is the invitation to the Arkansas Green Industry Days that we are having September 1-2, 2010 in Fayetteville, Arkansas. Even if you are not in Arkansas, you are welcome to come. The first day will consist of review and test for the Arkansas Nursery and Landscape Professional Certification. Day 2 will be seminars, a tour of the UA plant trials and a cookout. If you have time, we would love to have as many of you there as possible. Click here to register.